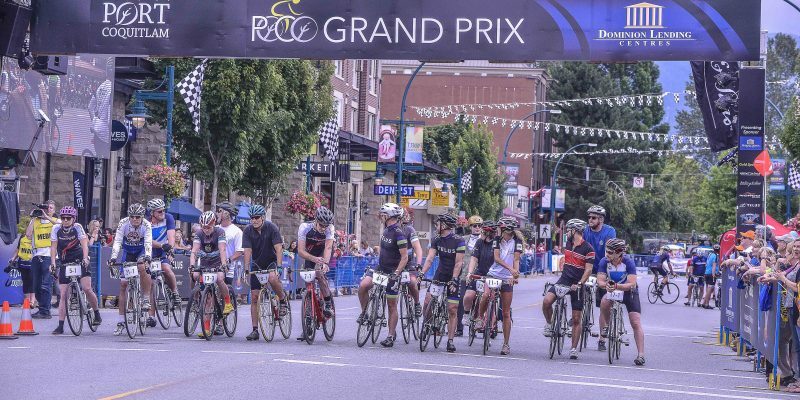 Planning has shifted into high gear for year two of the PoCo Grand Prix presented by Dominion Lending Centres on July 14, with calls going out for volunteers, sponsors and participants for the Kids’ Race and Corporate Challenge. In four months, thousands of people will converge on downtown Port Coquitlam for a day of professional cycling, live entertainment and free family activities. 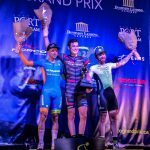 As part of BC Superweek – Canada’s largest professional road cycling series – the PoCo Grand Prix will be one of six events taking place throughout Metro Vancouver from July 7 to 16. The 1.3-kilometre track, start/finish line and main activities will remain the same as in 2016, but some events will start later, and downtown road closures on July 14 will start at 10:00 am and not be fully in effect until 1pm, based on feedback from area businesses. Amateur cycling races from 1:30-3 p.m. and pro races and awards from 6:45-9:20 p.m.
Live entertainment from 3:15-10:15 p.m. in Leigh Square sponsored by The Giggle Dam Dinner Theatre. Norco Bicycles Kids’ Zone from 3:30-7:30 p.m.
PoCo Grand Prix Expo tradeshow from 3-8:00 p.m.
VIP Experience from 3-9:00 p.m. (sponsors, corporate challenge participants – by invitation only), sponsored by Samz Neighbourhood Pub (food and beverage) and Phoenix Truck and Crane (lounge). Beer garden in Leigh Square from 3-10 p.m.
Corporate Challenge (business teams) races from 3:15-5 p.m.
Norco Bicycles Kids’ Race from 5:15-5:45 p.m.
BC Superweek Youth Race from 6-6:30 p.m.
BC Superweek Race Director Mark Ernsting said many of last year’s 250 riders are returning for 2017 based on their positive experience last year. “The PoCo Grand Prix more than proved itself in its inaugural year. We’ve been seeing a lot of interest from both new and returning riders from around the world who want to be part of this event in 2017,” Ernsting said. Complete event details can be found at www.pocograndprix.ca. About 200 volunteer positions are available for people ages 16 and up in areas such as: athlete accommodation, racecourse fencing and signage, course marshaling, event set up and take down, Norco Bicycles Kids’ Race and Kids’ Zone, spectator engagement, VIP Experience, beer garden, fundraising, the PoCo Grand Prix Expo tradeshow and pace vehicles. Volunteers must apply through the City of Port Coquitlam’s online registration process. Visit www.pocograndprix.ca/volunteer for information. Questions may be directed to volunteer@portcoquitlam.ca. Hosts are also needed to provide one or more visiting cyclists a place to sleep or shower and secure bike storage from July 8 to 17. See Get Involved at www.pocograndprix.ca for information. Sponsorship opportunities are available at all levels, including cash and in-kind contributions, participation in the PoCo Grand Prix Expo tradeshow, and other opportunities designed to enable businesses of all sizes to be involved. Based on the sponsorship level, rewards may include advance promotions, on-site signage and banners, display space, PA announcements and premium viewing. A major highlight for last year’s sponsors was admission to the exclusive track-side VIP Experience, which features complimentary food and beverages, prime viewing near the start/finish line, viewing screens and a social setting to network with other business and community leaders. 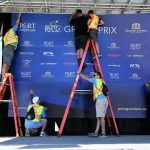 Sponsorship questions may be directed to grandprix@portcoquitlam.ca or to Graham Danziger at 604.927.5218. A full list of sponsors and more information is available at pocograndprix.ca. Business teams of four are invited to sign up for recreational, competitive or women’s races along the same 1.3-kilometre course as the pros. The races start at 3:15 p.m., and all participants will receive a free cycling hat and socks and entry to the exclusive VIP Experience, featuring complimentary food, refreshments and prime viewing of the races. Registration is $1,000 per team through www.pocograndprix.ca or by calling 604.927.7900. 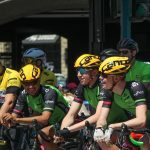 Kids ages 5 to 12 can see what it’s like to be a professional cyclist in downtown Port Coquitlam by joining the free, non-competitive Norco Bicycles Kids’ Race, starting at 5:15 p.m. Participants will be divided into two age groups: with ages 5 to 8 racing one lap of the 1.3-kilometre track, and ages 9 to 12 racing two laps. Register at www.experienceit.ca (5-8 years: bar code #22554, 9-12 years: #22555). Event details are posted at www.pocograndprix.ca.